Terra collection by bloem: the bloem terra round plant saucer tray protects surfaces from water damage. Use a bloem saucer to keep plants healthy & hydrated. Made with plastic, this plant saucer enables long-lasting use. 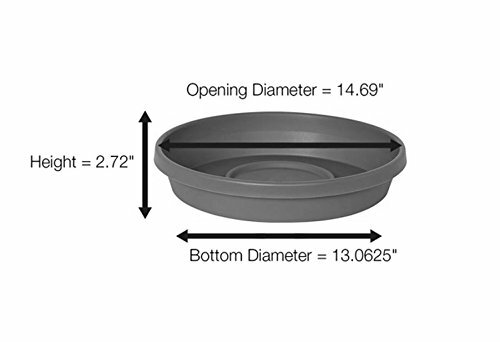 Heavy duty plant saucers will not leak & are perfect for indoor & outdoor applications. Made with an extra thick base which sits flat on the ground to provide ideal support & drainage for your plants. Saucers work with a variety of containers, including ceramic, terra-cotta, fabric pots & more. The terra saucer is circular in shape & is compatible with most planters. From the terra collection, this saucer is an ideal indoor & outdoor planter accessory. Traditional deep design, lightweight & durable. Planter sold separately. Made in the usa. 14.75 in. Top width x 12.75 in. Bottom width x 2.75 in. Height rugged polyethylene won't chip, crack, fade or leak like thin plastic or vinyl saucers. Ribbed bottom provides critical airflow for healthy root aeration. Thick resin construction with anti-fade uv protection offers durability that withstands the elements. 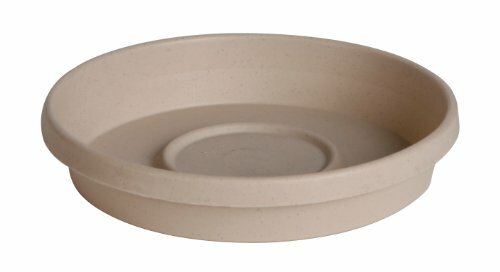 Includes 1 - bloem terra plant saucer tray 15" taupe fda approved resin for contact with edibles & food (plastic code 2 & 5).